Lately, breakfast/brunch consists of something fast and effortless. Most of my weekends are spent at the gym in the mornings followed by breakfast with my dad on Saturdays and somewhere for lunch Sundays. We normally eat the same things: Vietnamese or Chinese Hong Kong Cafe in Alhambra. I haven't ventured much because it's been hard to find a place that serves delicious breakfast food. To find one that has good food AND good coffee is a plus for me. Service was fantastic as expected. Our coffee cups were filled often which is always a plus. Their coffee is good in case you're a skeptic of "diner" style coffee, this is not that. 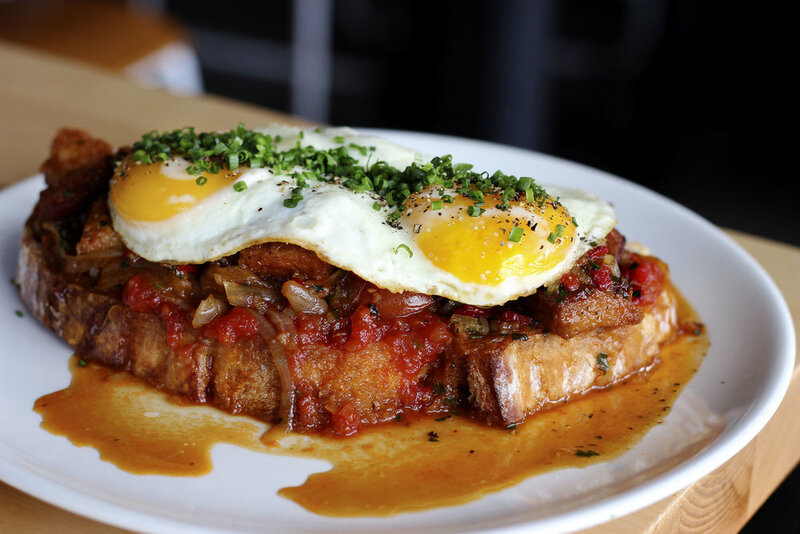 Pork Belly Hash - two sunny side up eggs, tomato marmalade, piquillo peppers, cherry tomatoes, fennel, toast. This is filled with chunks of pork belly perfect to fight through any hangover. Their commitment to sunnyside eggs is pretty much the most perfect I've seen. 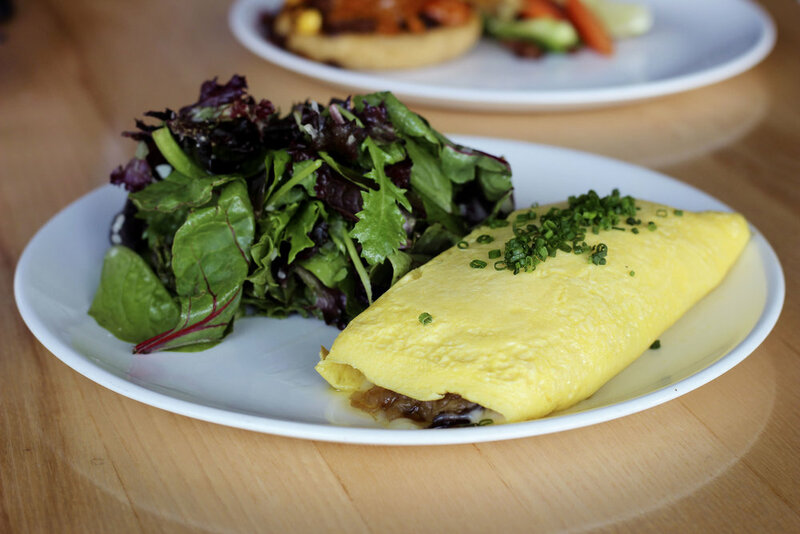 Forest Mushroom Omelette - bun shimiji, shiitake, maitake, raclette cheese, caramelized onions, and a side of mixed greens. Ok. Probably the best mushroom omelette I've ever had. The sweetness of the caramelized onions pairs so well with the raclette cheese. Of course the delicious mushrooms cooked with the onions brought a nice level of umami-ness to this that I did not crave meat. Brioche French Toast - toasted macadamia nuts, rum butter, coconut chantilly cream. I am not a sweet breakfast kinda girl. But damn did this sweep me faster than the extra food in the kitchen email from work. There's just something so decadent about this. It's quite hard to explain. The texture element on this was on point. The brioche is crispy all around with a softness when you cut into this. Homemade brioche yo! Housemade Sopes with Mole Hollandaise - poached eggs, red onions, cotija cheese, chorizo, fresno chilis, corn, cilantro. No words can express how great fresh tortillas are let alone fresh sopes. This combination is bonkers. The soft poach egg man. I've never had a sopes made like this before and now I'm changed forever. Smoked Salmon Benedict (you can also get neuske's canadian bacon) - house made english muffins, poached eggs, béarnaise, fried capers, dill, mixed greens. Their home made muffins remind me of the british muffins. So fluffy and holds all that bearnaise sauce and runny poached eggs. Not a lot of people do this, but when I see fried capers I know they are doing it right. Housemade Granola - Served with honey, berries, straus organic greek yogurt (or milk). Simple, but goes really well with the granola and a slight drizzle of honey. A pretty hefty bowl perfect for a morning fuel if you don't want something too large. 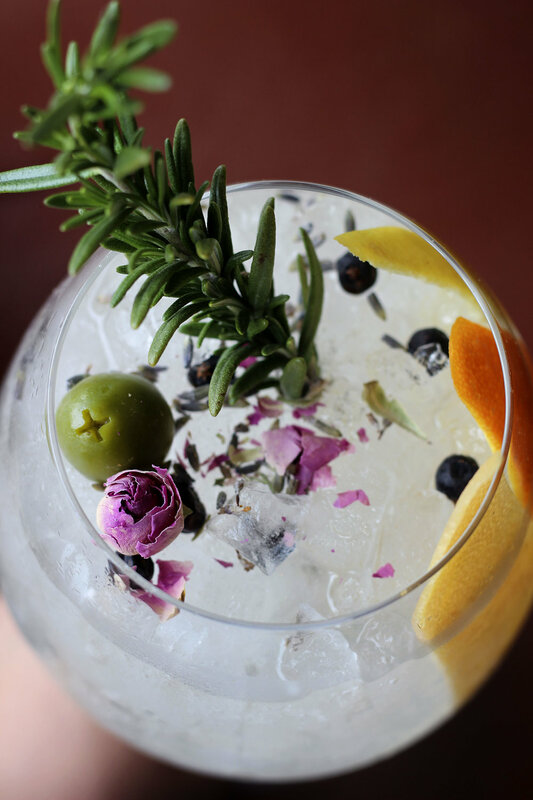 This is their Gin & Tonic on Tap - House made tonic, juniper berries, citrus peels, rose blossoms, and soda water. This isn't a part of their current brunch special, but if you are interested, I highly recommend their bottomless bellinis & mimosas for $35. This also includes one food item from the menu per person. There's a 2 hour seating limit for tables with bottomless bellinis and the $35 offer excludes the ribeye cap steak and eggs from the menu (what did you expect?). I must come back for dinner. Can't wait for you guys to try it out. And if you get to dinner before me, please let me know what you think! I think Kitchen Mouse is my favorite place for breakfast/brunch when I'm in Highland Park. Surprisingly, they serve incredibly delicious Vegetarian food. When I order a meal here, I don't really miss the meat. I believe it was a weekday when we came. They do get really packed on the weekends so it was nice to not have to wait in a line. My absolutely favorite thing to order here is their chilaquiles. I loved fried food. It's my life. And what better way to have it than to have it smothered in enchilada sauce drizzled with vegan cheese sauce which don't even get me started by how delicious this vegan whiz is. Their corn chips is like no other corn chip I've had for a chilaquiles. It's definitely thicker and most likely deep fried in house. The slaw also adds a nice to touch to break away the richness from the dish. SO I was never the sandwich kid. If it was a sandwich, it had to have meat in it. That or something very savory and flavorful. They have this Jo's Breakfast Sandwich. I glanced by it a few times. After little thought (maybe 5 minutes) I've decided heck why the F not. "grilled millet toast layered with smashed avocado, two fried eggs, arugula, chipotle cream and chili lemon dressing" even labeled you'll need utensils for this. SWISH. This was SO tasty. There's definitely a zip that will punch you right in the face from the chili lemon dressing. I think there was ginger in here as well, but I can't guarantee since it doesn't show in the description. But man. The millet toast, whatever millet means, was buttery, light and crunchy. This really held up to the eggs, the dressing and the smashed avocados. I would most definitely order this again with the chilaquiles. 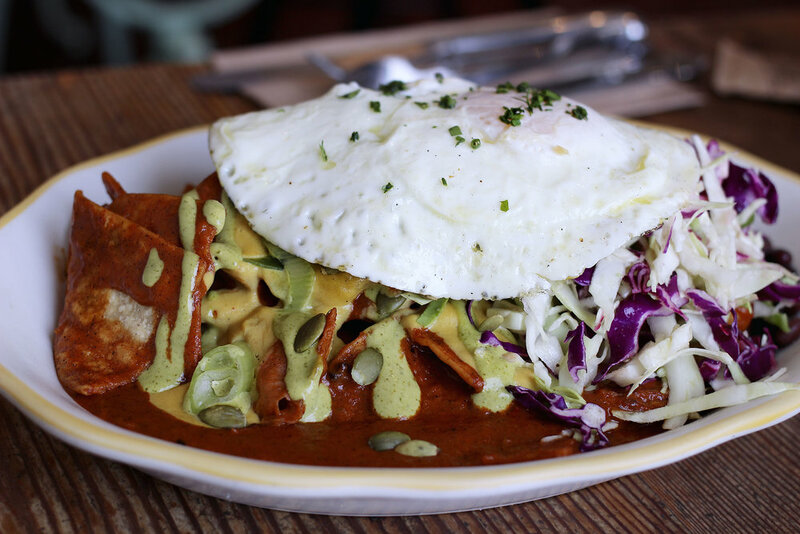 It's imperative that you order their Chilaquiles. Drink Houz is a new wellness cafe in the Westlake neighborhood of LA on the ground floor of HoM on Temple. Drink offerings include nutrient dense juices and smoothies, and a signature coffee and tea program created by Jeremy Gurney, featuring JGursey products. The flavorful menu of mostly vegan and vegetarian offerings is created by, Chef Amy Nesbit, with salads, sandwiches, bowls, and daily specials all made from the finest all natural ingredients. The bakery program is by Rockenwagner Bakery. I was pleasantly surprised with everything I had. I'm definitely not the type to go Vegan, but I wouldn't mind eating this a few times a week. Shot Houz- Wellness - Lemon, Ginger, Cayenne. The burn lasted a bit as it went down. Chop Houz (VG) - Chopped Baby Romaine & Kale, Heirloom Tomatoes, Chickpeas, Red Onion, Fresh Herbs, Cucumbers, Avocado, Honeyed Walnuts, Topped with Premium Aged Cheddar Served with Chive-Honey-Dijon Dressing. Refreshing and delicious. The Aged Cheddar added a nice nutiness to this salad. Zen - Kale, Cucumber, Toasted Sunflower Seeds, Avocado, Sprouts, Pickled Red Onions, Roma Tomatoes, Roasted Pears, Vegan Potato Roll (Got sourdough instead). You may not believe me, but this is probably one of the best sandwiches I've had. Simple does not do justice to how balanced the flavors were. No dressing was needed as the roasted pears added an extremely sweet round flavor complimented by the tartness of the pickled red onion. The toasted sunflower seeds added the perfect texture you would want in this sandwich. I would order this again, hands down. When you are in the area, had a great workout and want something clean, delicious and nourishing for your body, check out Drink Houz. I got to visit Osteria La Buca during Sunday brunch over the weekend. Los Angeles. You would think the 101 is free or at least think people are at church. No. The 101 towards downtown will forever be filled with cars along with stop and go traffic. Oh the joy. Knowing this restaurant is located on Melrose is also another stinger to think you will need to drive into LA. Before I got all boo-hoo-crybaby-face. My gps told me my destination would be on my left in 1 mile. 1 MILE. Melrose blvd is no joke. But to know the restaurant is on the outskirts of the busy street was music to my ears. And I got the ultimate VIP parking right in front. It was all luck and perfect timing coordination on my part. So Sunday, 12 PM, time to eat. Aye Aye to a full bar. Breakfast, lunch, dinner, whatever mood you are in, they will fix you up. No cocktails for me that day. Played 9 hours of Final Fantasy XV the night before so coffee was definitely imperative that day. California Toast - Toasted rosemary sourdough, avocado, soft scrambled eggs and an arugula herb salad. I loved the arugula herb salad. It was a nice touch and not something I expected when I took a bite. The eggs were perfectly soft scrambled for all the Chef Gordon Ramsay's out there. Neighborhood pizza - Guajillo sauce, taleggio cheese, pancetta, pickled pearl onions and baked egg. What part of that do you not like? This pizza was delicious. I loved the pickled pearl onions touch. We keep a jar of these all the time and it's a great palate cleanser. The pickled onions helped by cutting the richness from the pancetta and baked eggs. The guajillo sauce and taleggio cheese was a nice touch. And Pancetta? Well, Pancetta. Grab a slice, and swim it through the eggs. 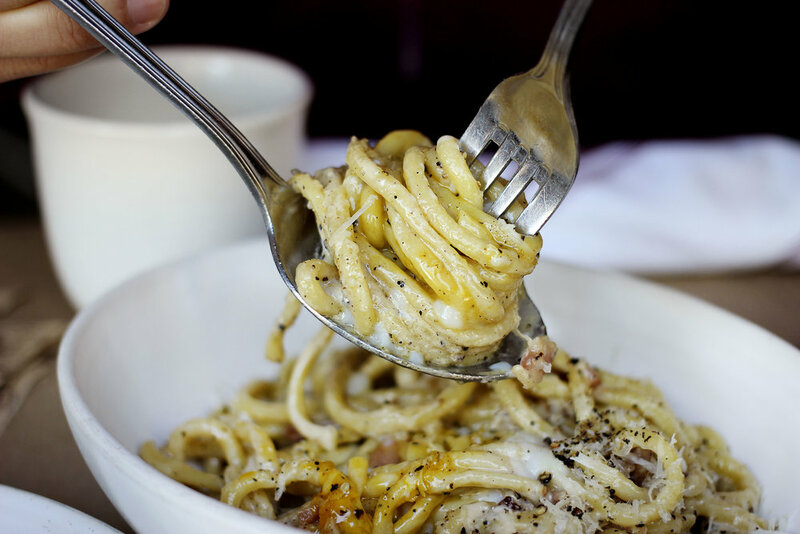 The famous Bucatini Carbonara that I've been seeing everywhere. Made with house pancetta, poached egg, and freshly cracked pepper. The pasta was perfectly al dente that springs back with each bite. The egg was also executed beautifully with a soft runny yolk. The element that brought this home for me was the cracked black pepper. It gave it a nice heat element that warms your face and your throat as it goes down. It had great flavor too. 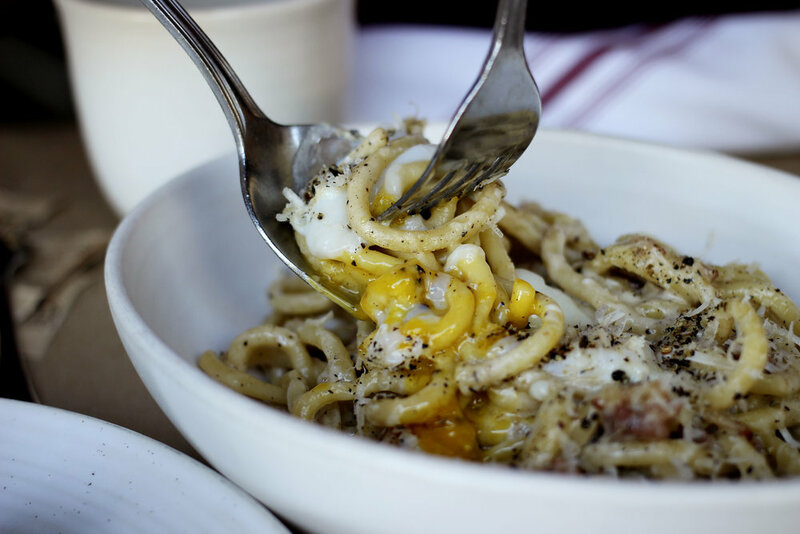 The steps to eat carbonara: Pop that yolk. Toss the pasta. Twirl your pasta from your fork in your spoon. Keep spinning. Eat. There are a few Greenleaf Gourmet Chopshop's located in SoCal, but the newest one that I am aware of is in Glendale. Being alongside with Shake Shack and Philz coffee on Brand, this street is going to be lit with hungry shoppers since there's not much offerings at the Americana. You can park at the structure located at the Americana for 90 minutes free, or you can cross your finger to find parking behind the restaurant (or front). But, there are plenty of parking arrangements in the area that are either free or affordable. They sell all kinds of beverages like infused water, espressos, and protein shakes like this Acai Berry with acai berry puree, strawberries, blueberries, apple and cranberry juices, banana & pure naked protein (great for on the go). Build your entree dinner options. Pick a protein and 2 gourmet sides. This is the flat iron steak with baked sweet potato fries with avocado pestp and pomegranate quinoa (they say pomegranate, but it's actually cranberries). Huevos Rancheros served with over easy eggs, refried black beans, chipotle sauce, pico de gallo, avocado & crisp corn tortilla strips. One of my favorite things to order when I'm here.